In the immortal words of George Carlin, “Why is there no blue food? “ According to The Straight Dope, it’s because leaves are green. If they were orange, we’d have plenty of blue fruits and vegetables. It seems that Mother Nature wants to set up the maximum color contrast between foliage and flowers or fruits. This contrast helps animals find flowers to pollinate and fruits to eat. Plants actually benefit when animals eat their fruits. Since plants can’t move much, they rely on animals to transport seeds and "plant" them in other locations. Leaves are green, so their visual opposite is red. Both major fruit and veggie pigments, carotinoids (yellow to red) and anthocyanins (red to blue), have red components. So even if a vegetable has blue pigment, it is likely to have red as well, rendering it purplish. Orange’s visual opposite is blue, so if leaves were orange, we’d see a lot more blue flowers, fruits, and veggies. But orange foliage? Not sure I’m ready for that. I know some readers are thinking, “But blueberries are blue!” George Carlin dismisses blueberries as “blue on the vine, but purple on the plate.” However, I recently discovered a food that’s purple on the vine but blue on the plate, or in the cup, more accurately. 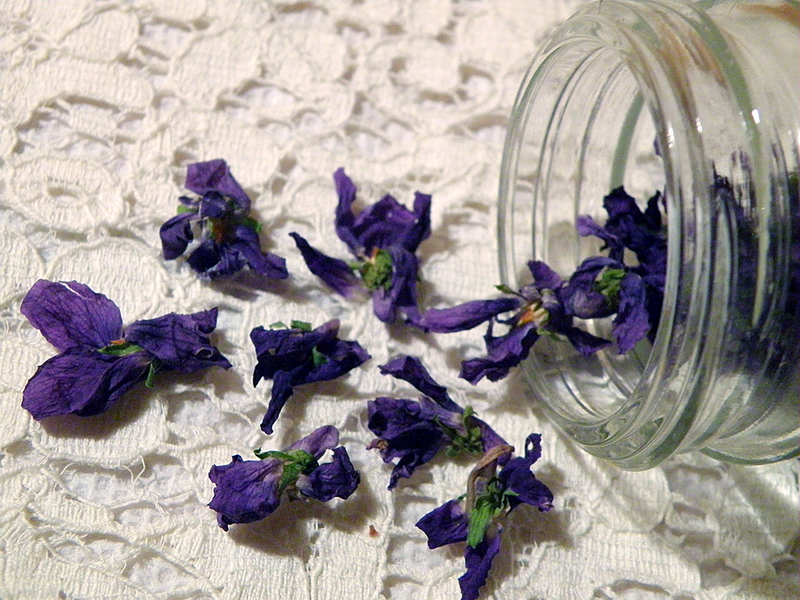 It’s the violets I harvested and dried last February. I have seen violet syrup and violet tea in a beautiful purple hue, and yet when I made tea from both fresh and dry violets, it came out bright blue. Perhaps a better question than “Why is there no blue food” is “Does anyone really want to eat blue food?” I tried it twice, and for me the answer is no. I give this recipe high marks for novelty, but can’t say I’d try it again immediately. Its floral taste is much more subtle than rose or jasmine, and not really as pleasant. Its slight sweetness is best when enhanced by floating one or two crystallized violets in the finished tea, which makes it pleasant but not memorable. There is an earthiness to the tea, and the dried violets make a rather unpleasant sediment, so beware of drinking the last drop. However, this tea does have potential for naturally dying Easter eggs next week. Dried violets have a slight floral scent and visual appeal, which makes them good candidates for potpourri. They actually taste somewhat sweet and earthy when eaten by themselves shortly after drying. Try it if you dare. According to ehow.com, you can dry herbs, including violets, in a cool oven overnight. Turn the oven light on in an electric range. Gas ranges will dry the herbs without light if the pilot light is on. I tried the second, faster method. Sandwich violets between two layers of paper towels on a plate. Microwave on “reheat” setting for 30 seconds. Remove from microwave, and take off top paper towel layer. Allow moisture to evaporate as they cool completely. Cover again and repeat process. By now violets will be fairly shrunken. When completely cool, re-cover and microwave a third time for 30 seconds. Violets will be almost dry. Remove them to another paper towel or porous surface and let sit for a few hours in a dry room. When completely dry, store in airtight jar. Place about 2 tsp. fresh violets per (6 oz.) cup in the bottom of a warmed teapot. Add the appropriate number of (6 oz.) cups of boiling water. Let steep for about 7 - 10 minutes. Strain and pour into cups. Serve with sugar, honey, or crystallized violets. 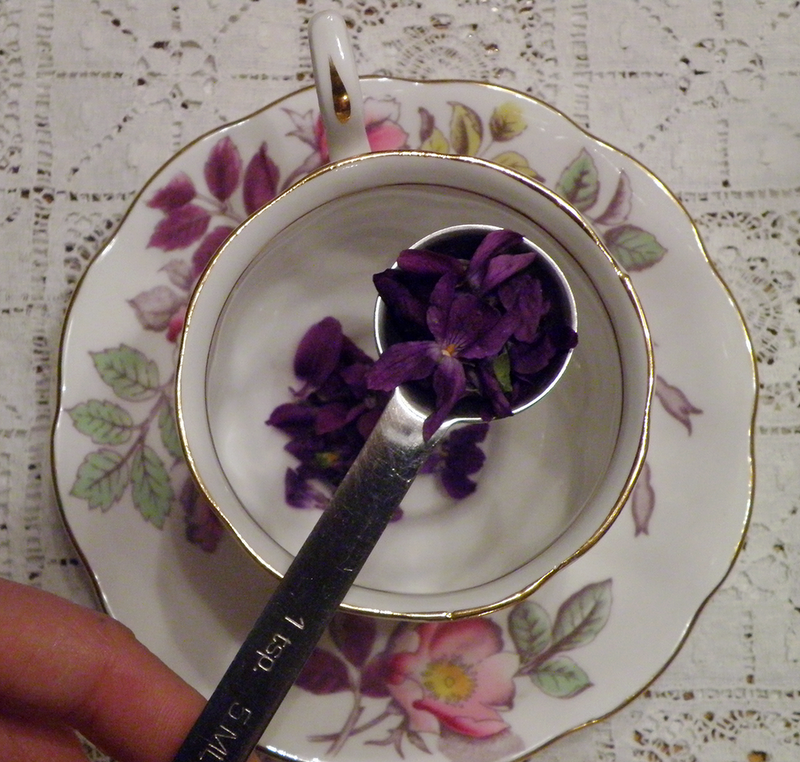 Or, use dried violets and brew tea in individual cups: Place 2 tsp. dried violets in tea strainer in teacup. Fill with boiling water. 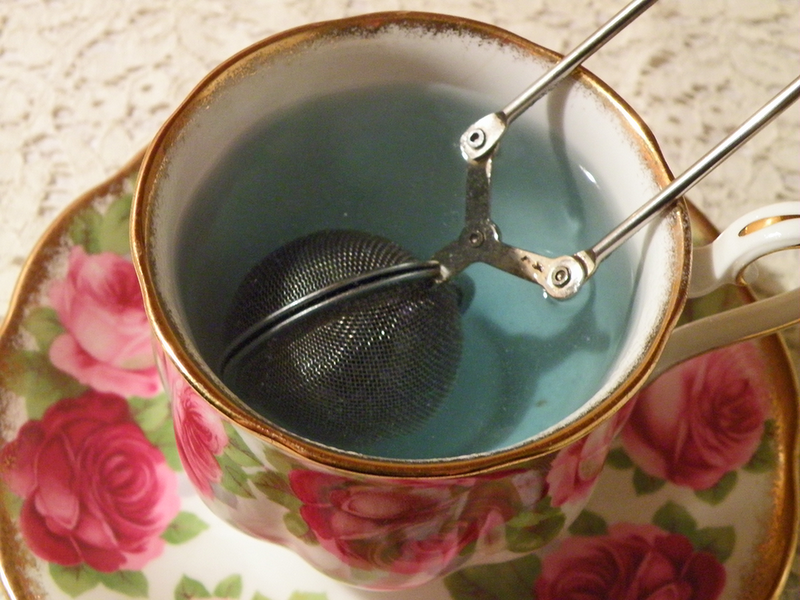 Let steep about 5 minutes, lifting strainer in and out of the cup to mix hot water through it. Serve with honey, sugar, or float some crystallized violets on top. 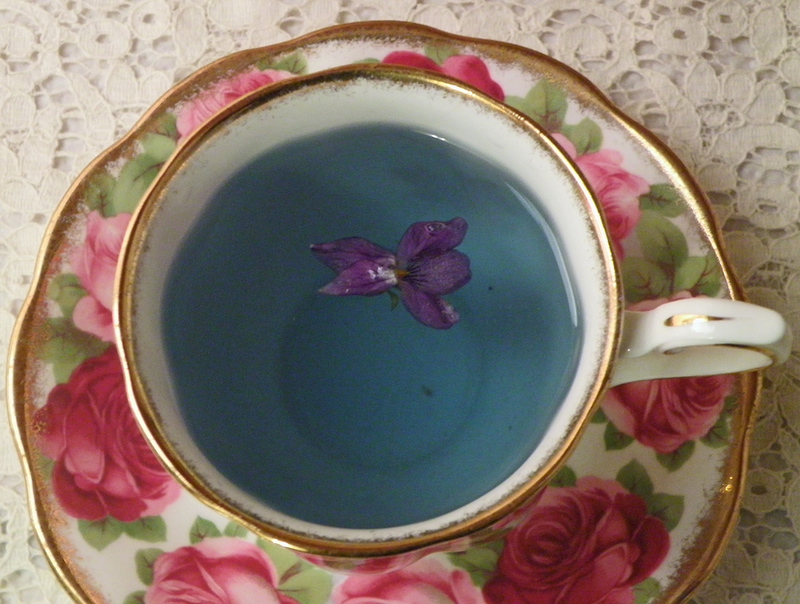 I have also heard that violet tea can be made with half violet leaves and half violet flowers. Violet leaves are healthfully high in vitamin C, and have been used in traditional spring tonics. 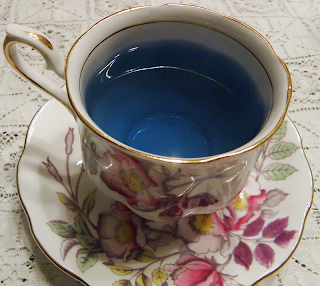 Assuming that you’re braver than I am…let me know how violet flower/leaf tea is. Happy New (Fruit & Vegetable) Year 2012!